Cool, good to know. Did you run the Orbit Eye bushings? To be honest I think the springs have actually gotten better with age..if that's possible..running the regular eye bushings, but I remember seeing the orbit eyes..they're pretty slick..wonder if you could retro into a regular eye?? ...wonder if you could retro into a regular eye?? Dragon is really liking the "Aeronose Show" this month. 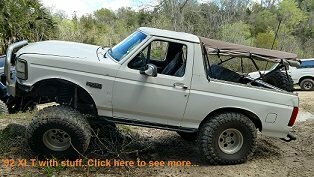 Mud, Snow, Mountains & Rocks, What More could a Bronco Lover want? (Maybe some Sand)? I also enjoy Reading & Watching the progression on each of your Rigs from their humble beginnings to where they are now, Good Stuff Guys. Thanks go to you All for sharing. I thru some Sand pictures from the Christmas Valley dunes in Oregon. they are nothing like the Oregon coast dunes though. It's the Bronco Addiction talking. You know,,, the More we see, the More we want. Still 8 days left in this little Aero-Fest. 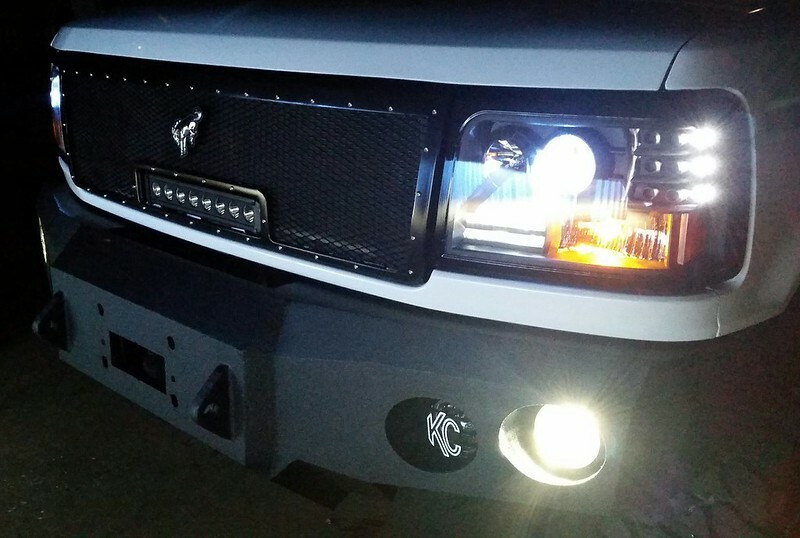 @Warhoss with that 3D Emblem surround, what a Great Idea. @RicksBroncoBeast How is the line locks working, any problems ? also any problems installing them ? @stan the man Nothing like a bunch of BKO Buddies coming to the rescue to help out !!!! .... Oh and the Blazer get's a pass as well lol very cool !!! jermil01, stan the man and White Dragon like this. @jermil01 how are you liking the synthetic rope on your Winch ? The only reason I went steal is the Arizona sun rots everything and didn't want it to fail when I needed it. Last edited by Quader1; 05-26-2018 at 10:38 AM. The Line lock was was very easy to install. All you have to do is find a good mounting point, then make a new brake line (making sure to double flare the ends). In my case I was able to cut the original brake line and bend it into a different shape and install new ends. And in my case I ran it into the MICO hydraulic parking brake solenoid and made them work independently. Installing the shifter momentary switch was a little different. Since the ford shifter is splined and not threaded I had to purchase a universal adaptor that has set screws holding it on but the knob screwed onto the adaptor. When I looked at the thread size I knew that I could make threads over the splines and it would be a lot more secure. I found a die that would be the right thread and walla, it was perfect. A drop of lock tight and it was secure. One more thing on the line lock design. A lot of line locks are dual line and other configurations. Fo me I needed a rear inlet and front outlet so I could run it in series with the MICO. I used Biondo (Moroso Style) Rebuildable Line lock which also did not have the warning of a maximum of 60 seconds of holding the solenoid engaged. White Dragon and Quader1 like this. I've only used the the synthetic line twice, but it's great. Much easier to handle than the steel cable. You do have to be more careful about scraping it across rocks, but that's easy enough..Also, you want to make sure to clean of any mud/debris after using it, but I chalk that up to normal maintenance. Mine is hidden behind the bumper so I don't have any concern about the sun wrecking it.. Your rear interior cargo light looks good, is that an aftermarket piece? I Like the way your rig turned out. it's good to see a rig that has a clean and somewhat stock kind of flavor. Thanks @Quader1 ! 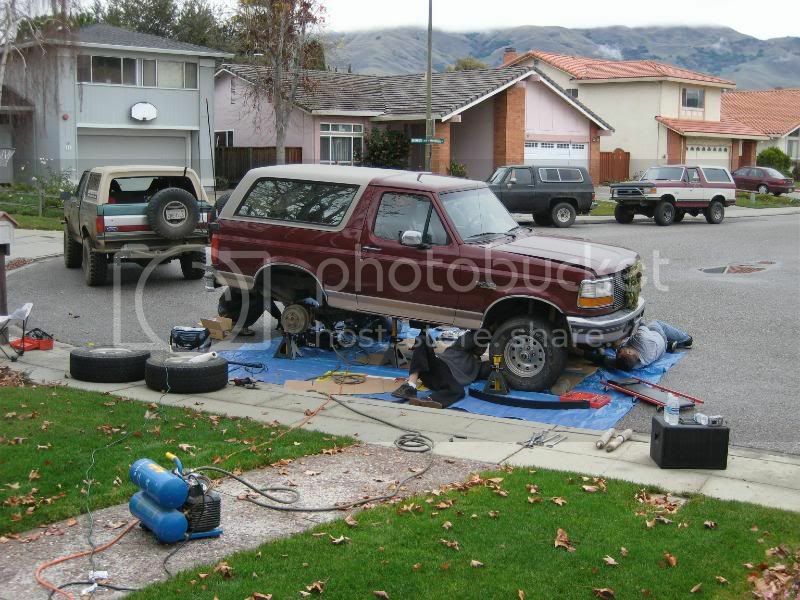 I'm not sure how to explain it and I just checked to see if I had better pictures of the exhaust toward the front end. I've got a buddy who has a shop where he has put on a many a mufflers and run those exhaust. He brought them down the passenger side. If you remind me. I can get some better pics to let you see for yourself? @BigBlue94 Oh ok I was just discouraged from the attempts of others that couldn't get that tail gate panel to clean up and I saw the prices on new ones to replace it so I just wanted to give the film a chance and I thought the dark skin would go better against all that white paint! 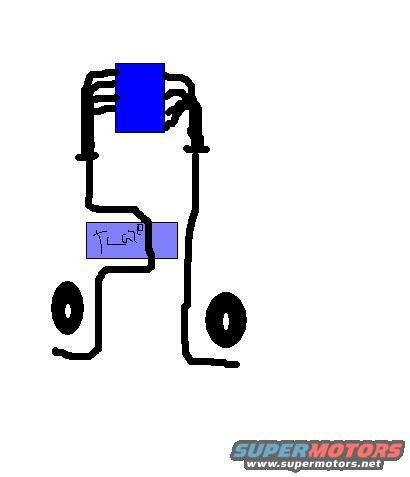 @Quader1 here's a really poor drawing of how my true duals were ran. Longtubes, 2.5" pipe, and flowmasters under the back floor. RicksBroncoBeast, Quader1 and Warhoss like this. I've been meaning to ask about your rims and i have questions. 1. Are you utilizing the "Run Flat" rings in those rims? 2. What Air Pressure do you typically run? 3. What is the "Lowest" air pressure you have tried? 4. If you use the "Run Flats" and air down below 10 psi, do the Rings interfere with your "Foot Print"? 5. Do You Like the "Run Flat" rings for off road use or would you not recommend them?